Two major events have happened in my kitchen over the past month. One, I've had gastroenteritis (not in the kitchen, mind), and two, we have a deep fryer. Now I know a deep fryer isn't particularly fashionable or healthy at the moment. But when one is limited in one's diet one really really fancies something crispy and fried... all the things one isn't able to order in a pub or restaurant. Chips, tempura, squid... and scotch eggs. Having managed to contract gastroenteritis, I started feeling a little better yesterday. However, not being hungry I thought perhaps if I made something I really fancied I might actually eat it. I've been tearing scotch egg recipes out of magazines ever since we got the deep fryer, so decided to give it a go. A thank you here goes to Tesco, who although put wheat in their sausagemeat don't actually put any gluten in their normal plain sausages. Yay! Ignore the potatoes. They were for the Irish one. As with most of my recipes please assume that I'm using gluten and dairy free ingredients when I say things like sausages, bread or flour. Just substitute for the real thing if you're able to. 1. Stick a clove of garlic in the oven to roast for 30 mins or so (with some baby potatoes if you've got an Irish other half with a passion for spuds with everything.) This is for the salsa. 2. Boil the eggs to taste - I hard boiled mine but you can soft boil them and apparently they stay soft when fried. Oh, and I used duck eggs cos I like pretending to be posh. Cool them in a bowl of water. 3. Make the sausage mixture - I used a pack of six sausages for four large duck eggs so you'd probably do six chicken eggs with six sausages. Split the skins and mix in a bowl with two finely chopped spring onions and a tablespoon each of smoked paprika, ground coriander, chili flakes and allspice. Season well and squish together. I used my hands but if you want to be clean and use a food processor you'd probably get a smoother mix. 4. Make some breadcrumbs - I used three white muffins so got a very crunchy set of crumbs because of the amount of crust. Whizz in a food processor for a few minutes. 5. Get some bowls ready - one with flour, one with two beaten eggs, and one with the breadcrumbs. 6. My eggs were still cooling at this point so I made the salad. Drain a tin of butterbeans and mix with two grated courgettes, six finely chopped mint leaves and a handful of peashoots (watercress would also work well). Season with lots of black better and a pinch of salt. The courgette's quite wet so it doesn't need a dressing. 7. For the salsa, chop tomatoes and mix with one finely chopped bird's eye chili. Make the dressing with three parts olive oil to one part white wine vinegar, salt and pepper, and a the roasted garlic squished and finely chopped. You can use raw garlic but only if you don't want to get too close to anyone in the next week. 8. Assemble the eggs. Using clingfilm on the worktop so it doesn't stick and some flour on your hands, squish a quarter (or a sixth) of the sausage mix with your hands so it's about 5mm thick. Lay the egg on top of it and mould the sausage round the egg. Repeat with the others. 9. Dip each egg in flour, beaten egg then the breadcrumbs, rolling it around and making sure you've got a nice coating. 10. I used a deep fryer for this part but you could just heat oil in a pan like normal people... I set my oil temperature to 170c and cooked each egg for 10 minutes. They came out lovely and brown and crispy. Make sure the egg is submerged in the oil so that it goes crispy all over. 11. This is the BEST BIT. 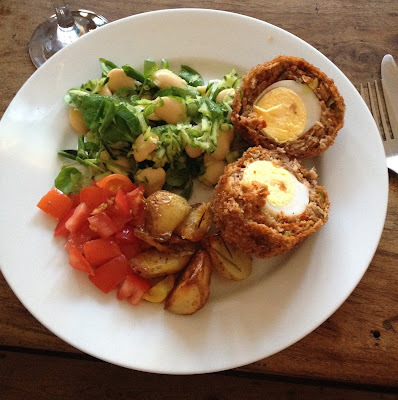 Using a nice big sharp knife, slice each scotch egg in half and feel free to make 'ooooooh' sounds. Serve! Slight warning - the salsa is fairly punchy.